How's was your 4th of July weekend. We had a marvelous holiday weekend... Friday evening we went a friend's home to see the fireworks. She has a perfect view of the fireworks over the Sacramento River. The weather has been in the triple digits for a couple of weeks now and I would love to take a trip to a white, sandy beach resort for a couple of days to cool off for awhile. Walking along a beach with my toes in the sand. Picking up sea shells and pieces of drift wood. Looking for beach glass would be fun too. Under the pergola is great place to have a tea scape...Oh, I mean a Sea scape... My Thompson seedless grapes are almost ready to pick and the Garden Party roses are blooming beautifully. My gladiolus are blooming and I thought they would look wonderful with my sea scape. When I started to think about the sea I knew I would like to find some shell napkin rings. While my granddaughter and I were in Orchard Supply looking for small lights to hang on the pergola we spotted these sea shell napkin rings. Bingo! Now I wanted to find some sea shell napkins. Then I remembered I had these napkins that I found at my favorite thrift shop a couple of years ago. I've been waiting for the perfect time to use them. The colors work great. While we lived in Fort Bragg we would go to the beach and search for colored glass...There was one spot where an old dump had been and the beach was covered with the most beautiful different colored pieces of colored glass. What a wonderful experience it was. I needed to find some colored glass. While shopping in World Market I found a bag of colored glass and couldn't resist putting it in my tea cups. The tea cups came from Tuesday Morning when I worked there. I have a set of 6 for $3.99. They were on clearance and I do love my thrifty finds. While in World Market I found a bag of drift wood and shells. Of course I wanted to put them in my cloche. A view into the garden. The place mats are from the Dollar Tree. I love orange and blue together. The sea shell dish was the inspiration for this 'Tea by the Sea' table. I found four shell dishes at the thrift store for $4.00. They were $8.00 dollars, but it was their ½ off sale. They are vintage Dansk International Designs LTD France. The blue dinnerware is from the Dollar Tree and the flatware is from Walmart. Love your shell napkins rings that inspired your tablescape. You designed it beautifully and economically.How pretty your glads are and the color worked so well with all the other things you had. Don't you love it when you realize something you have would love great? I am thinking beachy scenes and cool water too. Glad you enjoyed the fireworks in a great location. Seeing them over water is spectacular. 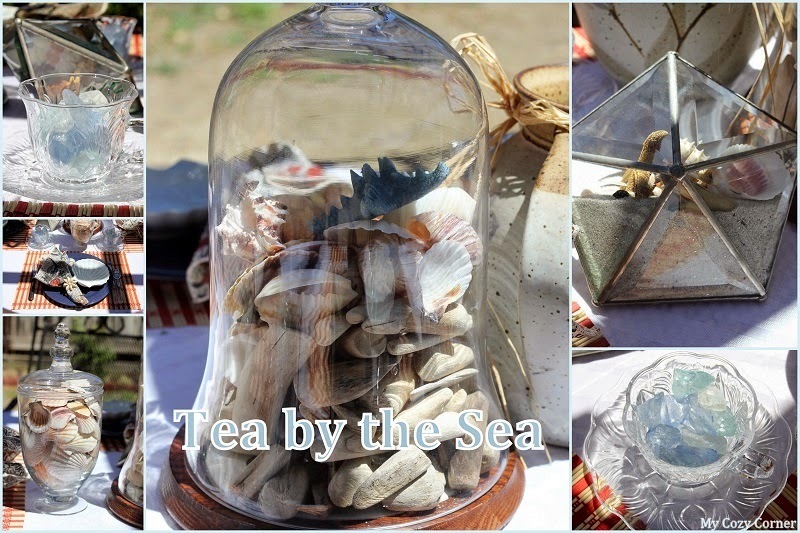 A lovely tea table with a beach theme. I have a few pieces of sea glass but have no idea where I got them but will have to look for some this summer. A very pretty teascape, with a nod to nautical hues and patterns! Your gladiolas are perfect! Your "table by the sea" is lovely.. The sea glass is beautiful and the flowers are lovely..Very cute ideas, thanks for sharing. Enjoy your new week! Hi Betty, what a lovely tea by the sea. I love your shells and the coloured glass. I love collecting shells too. Your gladiolus are beautiful, perfect for the setting. Your garden s looking very lush and healthy. Thank you for sharing your thrift finds. Hello Betty. Your tea by the sea setting is bright and lovely. Love the shells in the cloche, and your shell-themed napkins. Havve a wonderful week. What a lovely setting. I really like the sea shell plates and the shells under the cloche. We once lived by the Ocean for a few years and loved to collect shells! Still have a few from that time. If you can't get to the ocean, this is the next best thing! Such a lovely themed tea; I like all your sweet touches, and how you put it together in such a beautiful outdoor setting. I am visiting from Bernideen's and am your newest follower. Oh Betty, what a beautiful, fun, fresh and inviting tea table. I love that great sea-cloche! I love the beach and of course, all your elements here, like the napkin rings! This is a gorgeous beach themed table! I love it! I grew up at the beach and loved finding beach glass and shells on the beach and this certainly reminds me of my summers growing up! Thanks and I saw it at the have a daily cup of mrs. olson party! Have a nice weekend. What a perfect tablescape to cool you off in the hot heat of the summer! Love the pretty orange of the gladiolas and the driftwood and shells under the cloche is darling! Thanks for sharing your lovely tea by the sea with SYC.